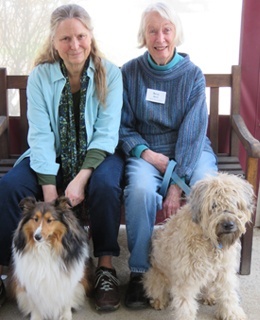 The Stephens Care Center hallways and living spaces are full of smiling people as Kendal residents Elizabeth Hole and Betsy David make their twice-weekly rounds with their dogs Spirit and Tibby, respectively. “They know exactly what to do when they come in here,” says an amused resident, pulling out a plastic container of treats she stores under a dresser. In another suite, Spirit jumps up on the bed to be petted by a resident just waking up. “I’m glad you came in,” he tells the foursome. Laughter, smiles and a spirit lifter – that’s the job of Spirit and Tibby and they, along with other pets in the care center, do it so well. The use of pets in medical settings dates back more than 150 years, according to National Public Radio. "One could even look at Florence Nightingale recognizing that animals provided a level of social support in the institutional care of the mentally ill," says Aubrey Fine, a clinical psychologist and professor at California State Polytechnic University who has written several books on the human-animal bond. But it was not until the 1970s that researchers started to uncover the scientific connection between animals and their impact on human health. “One of the first studies, published in 1980, found heart attack patients who owned pets lived longer than those who didn’t,” according to NPR. Loyola University researchers found that just five to fifteen minutes of animal therapy each day was associated with a 28 percent drop in the need for oral pain medication among patients recovering from joint-replacement surgery. A 2013 study from the American Heart Association found that the calming effect of petting a dog can help lower a person’s blood pressure. Additional studies being done in hospitals and nursing homes have shown a relation between pet interaction and improved mood and reduced anxiety. And in other instances, visits from therapy dogs positively impact the psyche of patients recovering from a devastating illness or medical event. Pet visits can reduce anxiety and stress for people of all ages, from children undergoing a dental procedure, veterans suffering from post-traumatic stress disorder and older adults living in a skilled nursing center. During any given week at Kendal at Oberlin, four dogs can be found greeting care center residents. Lizzie is a daily visitor, arriving every morning with her owner, Lynn Ensinger, director of clinical services. “Residents show appreciation for Lizzie nearly everyday. Recently one resident told me, ‘Lizzie is the best thing for the SCC residents, they really enjoy her!’” Lynn says. Additionally, six house cats live inside the care center. In addition, pet visits can reduce stress for the staff working at the care center, hospice or hospital. At the Hospital of the University of Pennsylvania, many ER doctors and nurses spend their lunch hour with animals from the states Society for the Prevention of Cruelty to Animals. "Healthcare is an incredibly stressful field from the medical intensive care to the emergency to the newborn nursery. It's stressful," says clinical nurse specialist Heather Matthew who helped launch the “Pet a Pooch” program. Kendal pet owners Elizabeth Hole and Betsy David have also seen the positive lift their pooches give busy nurses, therapists, aides and others working in the care center. “We didn’t know it would also make the staff feel better,” Betsy says.